A rose breasted grosbeak perched it a spruce tree waiting for me to fill the feeders. I live in South east Iowa and I have seen them in me feeders!!!! I have a picture of them! A PAIR OF ROSE BREASTED GROSBEAKS! I don't think Grosbeaks live in Utah. If they do, I've never seen one. Pretty birds... I like their red chest. Thanks for the great comment Carole,I'm glad you enjoyed it. Saw my very first Red-breasted Grosbeak on the feeder today! Absolutely beautiful! I'll keep looking for his friends...Thank you for the fine page/pictures. Thanks for the comment Nelson,I'm glad you enjoyed it. Thanks for the comment Charlotte,I'm glad you enjoyed it.These grosbeaks really like sunflower seeds and they keep coming back for them. 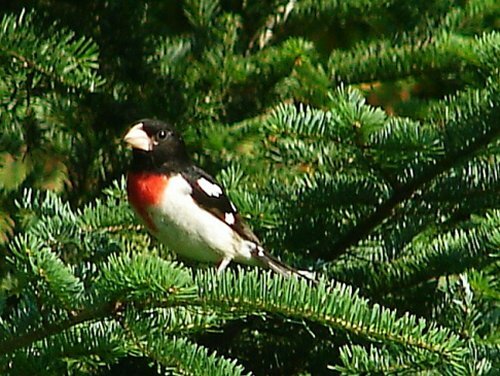 We have the RED-BREASTED GROSBEAK for the first time in all the years we have had a finch feeder up. Thanks for the comments Joel and Lisa,I'm glad you enjoyed it.We also have the evening grosbeak that comes to our feeders. This species must travel in groups of three because that's exactly how many I have at any given time. I also just noticed them on my sunflower feeders this morning for the first time. Previously, I had only spotted them in the trees next to the house. Thanks for the great comments Dencil and Helen,I'm glad you enjoyed it. Thanks for the comment Alandra,we have two of these males that are regular visitors at our feeders this summer along with their mates.